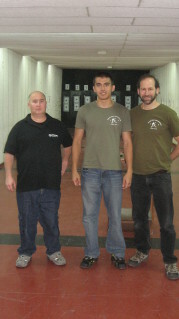 Head Instructor Moshe Katz is certified in urban combat shooting. 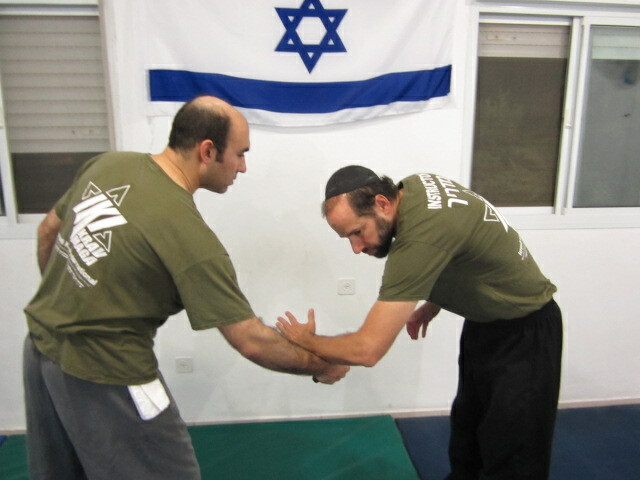 Krav Maga is designed for today's reality. It is unlikely that in modern day Israel you will be attacked with a Samurai sword or a pair of nunchuks. As such, with limited training time, we do not focus on defending against those weapons. Similarly there is no record of anyone in Israel being attacked with a Chinese broad sword or with Ninja throwing stars. Guns, knives, and sticks, on the other hand, are very much a part of our reality. It is our belief that in order to properly defend against a weapon you must have a basic understanding of how that weapon works. You have to have experience from the other side, you need to be the attacker. Therefore when we do our knife defense training we not only practice defending against a knife attack but we also take a turn as the attacker. When it comes to hand guns we believe every student over the age of 18 should have a basic understanding of how a gun works. Penny Russel from England, with instructor Dror looking on, wins balloon shooting competition. Dror said, "You are not going home, you will stay here with the Israeli Mossad." Jon Oli Jonsson from Iceland hits the target. We should be familiar with the sound, the smoke, the surprise of the bullet, the flying cartridges and the general feel of a gun. We believe that the first time you handle a gun should not be when some street thug or terrorist points one at you. Penny, Jon Oli, and Lance, dry shooting in Maaleh Adumim, Israel. 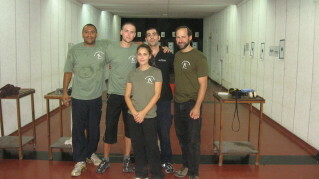 First IKI graduating class of level one shooting, with shooting instructor Dror. Each graduate received a certificate after passing a practical test. Dror also gave the participants a sample of Israeli style point shooting. After hitting nearly all of them right in the center he said, "I am a bit rusty". 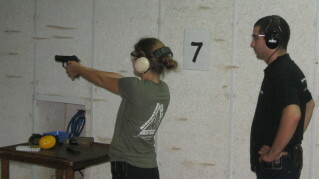 More advanced shooting classes are available, at the Dani Ho center in Ceaseria and at "Caliber 3" in Efrat. These can include use of high powered paint ball guns and M -16 rifles. 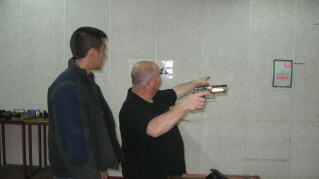 It is IKI policy that one must first complete the basic hand gun course here in Maaleh Adumim. 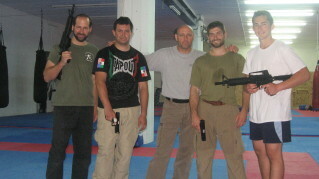 As long as guns are part of our reality they will also be part of our Krav Maga training. 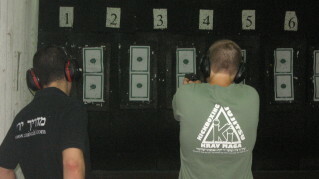 Richard received a grade of 100 and was certified in use of a hand gun. Pictured here with Moshe Katz and Gabi Efrat.